The final novel in the epic Rage War trilogy of original Alien Vs. 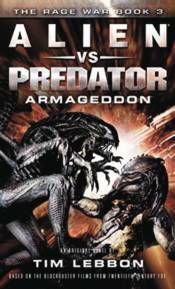 Predator novels, following on from Predator: Incursion and Alien: Invasion. The sudden appearance of Predator ships in human space causes the Colonial Marines to launch a counter offensive, only to discover that the Predators and the human race share a common foe - an enemy who has learned how to turn Aliens into the perfect soldiers. The Alien army is unstoppable as they sweep into human space and approach their ultimate target: Earth.